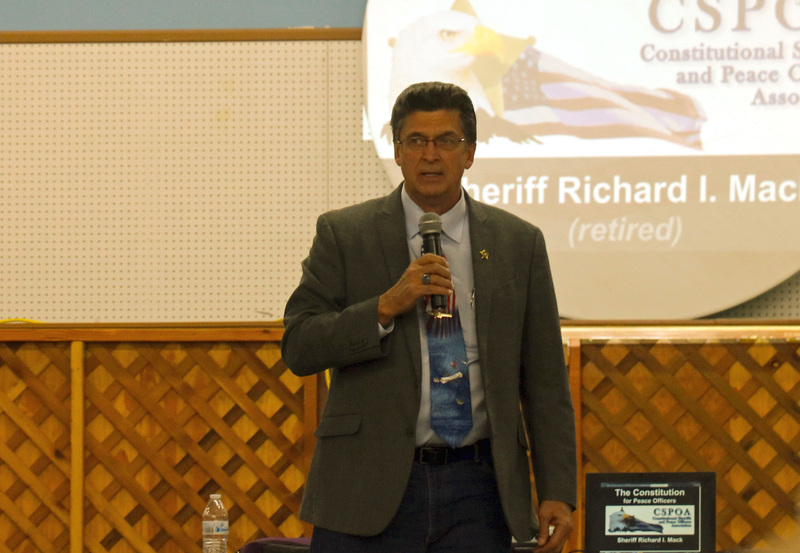 The day after a 41-day antigovernment standoff ended last week at an Oregon wildlife refuge, former Arizona sheriff Richard Mack rode into rural Harney County and boldly claimed to have a full understanding of the militia takeover of a national wildlife refuge. Without mentioning Harney County Sheriff Dave Ward by name, referring to him as “the local sheriff,” Mack bluntly accused the lawman of failing to do his job by refusing to be an “interposer” between “overly aggressive and corrupt” federal officials and local ranchers Dwight and Steve Hammond, who were sent to prison for setting fire to public land. Mack heads the Constitutional Sheriffs and Peace Officers Association (CSPOA), a states’ rights group that holds county sheriffs to be the highest constitutionally recognized law enforcement officials in the land, capable of standing in the way of federal law enforcement. “It’s obvious he did not do his job,” Mack said of the Ward, who has received high praise from the FBI and many county residents for his response to the antigovernment occupation of the Malheur National Wildlife Refuge. “I have never met a man who cares more about the people he serves, who cares more for the community in which he lives,” FBI Oregon supervisor Greg Bretzing said of Ward after the standoff ended Thursday, when the final four occupiers surrendered. Two dozen involved in the illegal occupation face federal conspiracy charges, and one man, Arizona rancher Robert Lavoy Finicum, was killed by state police officers after charging an FBI road block and reaching in his a pocket where authorities say he had a loaded handgun. The jail booking photos of those arrested had just been released to the public when Mack arrived in Harney County. Wearing a necktie patterned after the American flag, Mack spoke Friday evening to a crowd of a couple hundred county residents –– many of them cowboys with mud on their boots and dipping pinches of chewing tobacco, who rose from their metal folding chairs in the county fairgrounds to greet Mack as if he were a political candidate. And Mack was happy to respond, pounding out a simple refrain: The CSPOA is the only organization of its kind that can stand up to what he sees as the excesses and corruption of the federal government. “You have been thrust into the international limelight,” Mack told attendees seated in cold metal folding chairs in a drafty building on the Harney County Fairgrounds. But Mack added that he had no idea the occupation of the federal wildlife refuge – a complex of buildings -- would follow the Jan. 2 demonstration in Burns that he and other CSPOA members attended and supported. Sheriff Ward, a modest-sounding man who appeared on the brink of tears in talking about the end of the standoff last Thursday, wasn’t in attendance at the county fairgrounds for Mack’s speech, but in a back row, there was Alan Johnson. Running as a CSPOA-sanctioned candidate against Ward, Johnson was beaming with pride as he got Mack’s endorsement in what briefly, at least, sounded like a political rally. The Johnson vs. Ward sheriff’s race in Harney County Oregon -- to be decided in the November election -- seems to have the making of a political hangover from the Malheur standoff, likely keeping alive much of the bitter divisiveness that has divided the sprawling eastern Oregon community. Mack told the crowd he will be watching and supporting Johnson. Mack and his organization were visible participants in the Jan.2 demonstration, along with armed militia groups including the Idaho and Oregon III% organizations. “Dwight and Steve Hammond should not be in prison,” Mack said to the applause of the audience on Friday. To hear Mack tell it, the Harney County sheriff should have been ready to stand up and block federal agents from attempting to arrest the Hammonds if they had decided not to voluntarily report to prison to serve 5-year terms after being convicted by a jury of arson on Bureau of Land Management lands. “When an injustice occurs in your area, who has the legal, constitutional and moral responsibility to step in?” Mack asked the audience before the response, “The sheriff.” He later broadened the “blame” for the Hammonds’ prosecution and conviction “on every state official” in Oregon, including Gov. Kate Brown, a Democrat. Neither Sheriff Ward nor the Hammonds wanted anything to do with the becoming the cause célèbre for the antigovernment movement when Mack and several of his CSPOA followers and a crowd of vocal, gun-toting militia and III% antigovernment Patriots showed up in Burns for the Jan. 2 rally. The marchers that day went past the sheriff’s office and symbolically threw rolled pennies provided by Ammon Bundy at the doorway –– apparently suggesting the sheriff was a sell-out. Then, the marchers, including Mack, went a few blocks down the street where they placed roses in the front yard of the home of Dwight Hammond. He politely greeted the militia crowd at his door, shook hands repeatedly, but stayed steadfast in his plan to voluntarily report to federal prison in California with his son on Jan. 4 to begin their terms. In what was a surprise to many, Mack said, the marchers became frustrated and hatched the refuge takeover plan. “Some of these people were at their rope’s end,” he said. “I don’t support the tactic, but I understand the frustration.” In reality, the plan to take the refuge had already been plotted before the Jan. 2 demonstration, a federal indictment alleges, and was put into action because Ward wouldn’t intervene. “I had no idea they were doing that,” Mack said of the takeover plans of Ammon and Ryan Bundy, sons of Nevada rancher Cliven Bundy, now facing five felony charges himself for an April 2014 precursor standoff at his ranch in Bunkerville, Nev.
Mack said he had warned Ammon Bundy when he heard about the takeover. Mack also claimed that, “The people that were in the march, as far as I know, didn’t go out there” to the refuge. Challenged on the accuracy of that claim with the names of takeover leaders, now indicted, who were in the Jan. 2 march, Mack modified his statement, conceding some demonstration participants subsequently did assume roles in the refuge standoff. While Ammon Bundy and 22 other occupiers face federal indictments for their roles in the alleged takeover conspiracy, Mack isn’t shy about saying he hopes the episode will propel CSPOA to national prominence with a swelling membership of sheriffs and private citizens. “We’re certainly trying to make it happen,” Mack said when asked if the Malheur standoff will boost the visibility and membership of CSPOA. “CSPOA, I believe, is the only peaceful solution that people of this country have left."